Mrs Smith Sweet Potato Pie ONLY $2 At Walmart! HOT DEAL! Disney Rapunzel Deluxe Toy Set ONLY $2 At Walmart! AWESOME! Have you heard? Walmart recently launched their own eBook store called Walmart eBooks by Rakuten Kobo in an effort to compete with Amazon. Walmart customers can now choose from over 6 million titles in Kobo’s library, as well as sign up for a new audiobook subscription service for just $9.99 per month (as a comparison, Amazon’s Audible subscription is currently $14.95 per month). Even sweeter, through December 31st, Walmart eBooks is offering NEW customers $10 off your first ebook or audiobook purchase of $10.01 or more on Kobo.com, including new releases and bestsellers! And if you sign up for the audiobook subscription, you’ll receive a FREE 30-day trial! Note that the $10 credit may only be used once, and is valid for first-time purchasers only. If you have made a purchase using your Walmart eBooks account in the past, you will not be eligible for this offer. Kobo.com is an eReading service that delivers the best digital reading experience, offering one of the world’s largest catalogues with millions of titles, award-winning eReaders and top-ranking apps. Now available for purchase in Walmart stores, Digital Cards are an easy way to buy or gift eBooks, audiobooks, and audiobook subscriptions for the booklovers in your life, or for yourself. See more of our favorite books here! Lego Sets – *HOT* Walmart Clearance – Member Find! 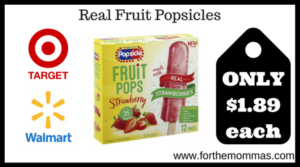 The post Target and Walmart: Real Fruit Popsicles As Low As $1.89 appeared first on FTM. Hop on over to Walmart.com and score this Minecraft Nintendo Switch Game for just $19.99 (regularly $29.99)! If you’re headed into Walmart soon, be on the lookout for Hershey’s Kisses Color Your Party 17.6oz Bags possibly on clearance for only $3 (regularly $5.65). *HIP TIP – Before making a special trip to your local Walmart store, click on the SKU numbers listed below and enter your zip code to check stock and price at your local store. Note that Brickseek is NOT always accurate with stock and pricing. These chocolate kisses come in several fun foil colors including pink, green, red, blue, yellow, white and more. They are perfect for parties or to have on hand for a fun treat for when you’re craving chocolate! IHOP wants to give you FREE stacks of Pancakes! Backyard Discovery Timberlake Cedar Wooden Playhouse – Walmart Clearance!